Pumpkin meringue pie. At long last, a slice of pumpkin pie can be considered stunningly sophisticated as well as complete in and of itself—no dollop of whipped cream required. 1. Preheat the oven to 375°F (190°C) and adjust an oven rack to the middle position. Line a rimmed baking sheet with parchment paper. 2. On a clean, lightly floured work surface with a lightly floured rolling pin, roll out the dough until it forms a 10-inch circle. Fold the circle in half, place it in a 9-inch pie plate so that the edges of the circle drop over the rim, and unfold the dough to completely cover the pie plate. Using your thumb and index finger, crimp the edges of the pie shell. 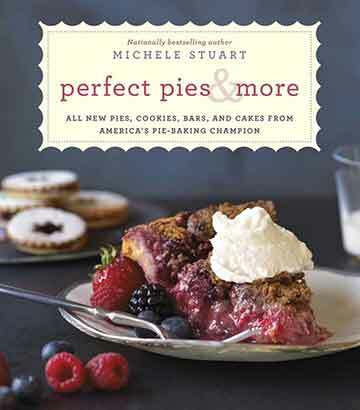 Lightly brush the edges of the pie shell with heavy cream (this creates a perfect, golden brown finish). Set aside while you make the pumpkin pie filling. 3. Using an electric mixer on medium speed, combine the pumpkin purée and eggs until really well mixed. Add the brown sugar, cinnamon, salt, and nutmeg. Mix the ingredients together, scraping the bowl down several times. Add the heavy cream and mix once again, until all of the ingredients are thoroughly combined. Pour the pumpkin mixture into the unbaked pie shell. Carefully slide the pumpkin pie onto the baking sheet. 5. Just before serving, preheat the oven to 400°F (204°C). 6. Using an electric mixer on high speed, beat the egg whites until they become foamy. Add the cream of tartar and salt and continue mixing until soft peaks form. Slowly add the sugar, 1 tablespoon at a time. Once all the sugar has been added, add the vanilla and beat for 30 more seconds. It should be light and fluffy. To test it, insert a spatula into the mixture and quickly pull it out. If it forms little peaks but does not fall, you have achieved the desired consistency. 7. Using the spatula, spread the meringue on the pumpkin pie, mounding the meringue in the center of the pie and lifting the meringue into swoops and swirls and peaks. Take care to spread it generously all the way out to the edges of the crust to completely cover the pumpkin pie filling because the meringue will shrink during baking. 8. Place the pumpkin pie on the middle oven rack and bake for 6 to 10 minutes, or until the desired brownness has been achieved. You’ll want to check the meringue frequently, keeping an especially careful eye on it as soon as the tippy tops of the peaks begin to turn brown. (If you have a kitchen torch, you can also use this method as an alternative, but be careful to spread the flame evenly across the entire surface to achieve a uniform look.) The pumpkin pie is best served the same day. What a delicious twist on pumpkin pie. We—myself, my husband, and our two French guests—LOVED this pumpkin meringue pie. It wasn’t too sweet or too heavily spiced but perfectly pumpkin-y and light from the meringue. I could’ve baked the pumpkin pie longer so that it was more set, like traditional pumpkin pie, but the texture was actually really nice as a custard and pudding. The pie dough was easy enough to prepare in the mixer; I had no problems with it at all. The meringue was also simple to prepare. What surprised me was that the meringue actually shrunk as it cooled. Initially it extended to the end of the crust, but as it cooled, it pulled in so that you could see the pumpkin pie filling. It shrunk maybe 2 inches all around. Still, this was an amazing dessert! I’m not a pie expert, but this pumpkin meringue pie recipe changed my relationship to pies, it was so good! I left the pumpkin pie in the oven for 55 minutes, until the center was set. I baked the pie the day before, refrigerated it overnight, and made the meringue topping the next day about 2 hours before serving. The meringue-topped pie needed about 8 minutes to become a nice brown. As I said before, I’m not a pumpkin pie expert, but I followed this recipe to the letter and it turned out great. This pumpkin meringue pie recipe is a keeper—quick to put together, the ingredients are readily available, and the finished product make’s a beautiful presentation. The recipe was easy to put together. I used pre-made (gasp!) pie crust, which didn’t detract too much from the finished product. I browned the meringue with a torch, which was quicker than the oven method. The pie was quite tasty and the meringue added a nice finish. I made this pumpkin meringue pie with fresh pumpkin—a Long Island Cheese picked just a few days ago by a local farmer. I roasted the pumpkin, cleaned out the seeds, scooped out the flesh and then I puréed it and measured out the amount for the recipe. The pumpkin pie portion of the pie was fantastic. I really didn’t miss ginger or cloves. While the meringue on top of the pie was good, to me it seems seemed extraneous. The meringue took about 5 minutes. Remember not to touch the pie plate with your bare hands, because even though it’s only been in the oven 5 minutes, the plate becomes very hot. 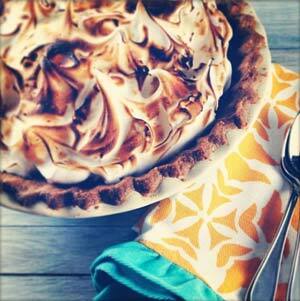 Pumpkin Meringue Pie Recipe © 2013 Michele Stuart. Photo © 2013 Ben Fink. All rights reserved. All recipes and photos used with permission of the publisher. The second time I made this pie (yes, it’s still November and I’ve made it twice already), I used a torch to brown the meringue. I also made sure to use ALL of the meringue and spread it out to the outer edges of the pie pan. It was even better the second time around! It just doesn’t get any better than this. Bravo! Ditto that, Brooks. Ditto that. Yes, yes, yes and yes! Everything about this gorgeous pie is a yes! Meringue will definitely give a new dimension to this dessert. Beautiful. Happy Thanksgiving to you all! Happy Thanksgiving to you, too, jamielifesafeast. Will you be doing anything in Nantes to celebrate Turkey Day? This is from Cecilia at OneVanillaBean.com. Gorgeous, huh? She didn’t leave how to use this……. Could you help me? Hi Sharon, meringue powder is used to add body to royal icing, meringues, and boiled icing, and can be used to stabilize buttercream frosting. Do you have the name of the manufacturer? I might be able to do a bit of research into the proportions that should be used.